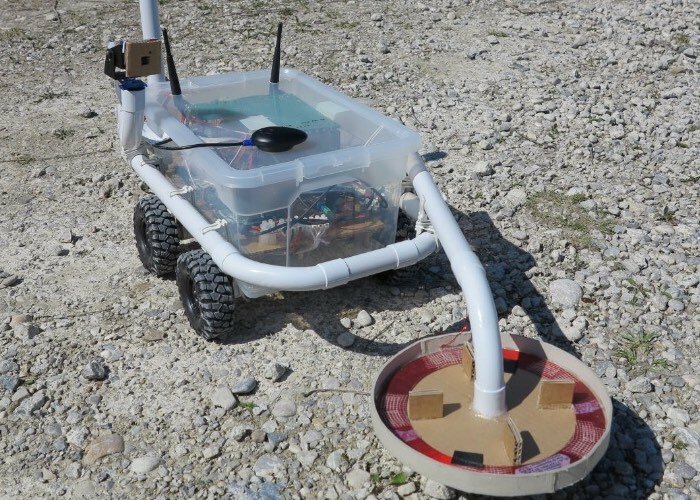 Raspberry Pi enthusiasts looking for a little inspiration for their next project may be interested in this awesome Raspberry Pi powered metal detecting robot that has been created and equipped with GPS support for autonomous movement. The Raspberry Pi robot has been created by Ingmar Stapel based in Munich, and is also fitted with a pan and tilt camera allowing anyone that is controlling the robot remotely to see exactly where they are going as they scan the area for metal. Check out the video below to learn more and see the Pi powered metal detector robot in action. Its creator explains a little more about the inspiration and construction of the robot. The Discoverer is a remote controlled car with a Raspberry Pi as brain. This is actual the biggest robot I build. It is equipped with a metal detector, a pan&tilt kit for the camera and a compass module. I designed this robot as a beta test model to carry the metal dector and to test the GPS reciever combined with a compass module. I learned a lot by building this robot about the electronics as well about the chassis. The wheels are to small to drive on unpaved roads. The picture below shows the parking yard of the university next to me. As you see in the picture below the weels are very small compared to the stones. With the GPS antenna the robot is able to locate his position in the field. In combination with the compass module the robot is able to detect the direction it is facing too without driving around and calculation the direction. The setup of the GPS antenna was very easy. To setup and configure the compass module was not so easy. Now I bought the Raspberry Pi Sense Hat. Hopefully this is easier to setup. If you enjoyed this article you are sure to enjoy how to build your very own Arduino wind speed meter or anemometer project which is easy to build with basic Arduino skills. If you found this article interesting you might also be interested in this list of awesome Raspberry Pi Zero projects we have put together or this guide to Raspberry Pi Display HATS.